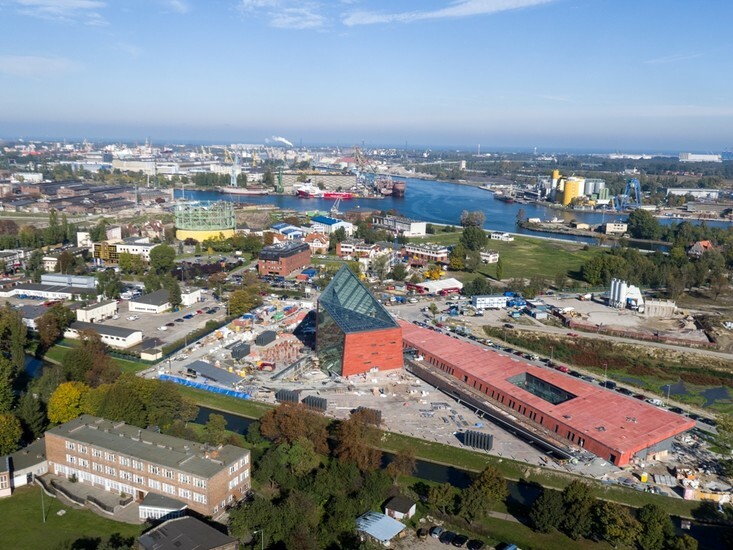 World War II began with Germany’s attack on Poland at the Polish military base at the Westerplatte Peninsula on September 1, 1939 and it’s therefore appropriate that this remarkable museum, opened in March 2017, should have been built in the city. 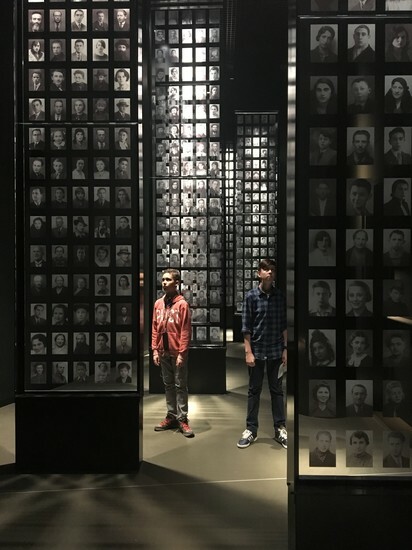 A conflict that would go onto claim the lives of an estimated 55 million people is a both a huge and complicated story to tell but this exhibition which tells the story with one eye always on the experience of Poland, does in our opinion achieve that quite brilliantly. 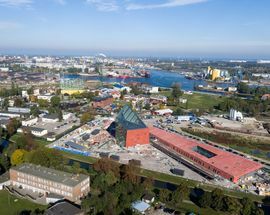 With the encouragement of the Gdansk-born former Prime Minister Donald Tusk (now President of the European Council), a competition was opened to find a design for the new museum. 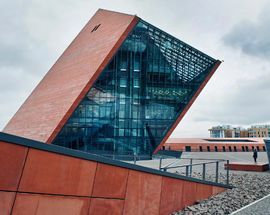 With a judging panel which included the likes of Daniel Liebeskind and the art historian and Director of the Museum of London Jack Lohman, the Kwadrat architectural studio from the nearby city of Gdynia was chosen to design the new museum. Built on land on ul. 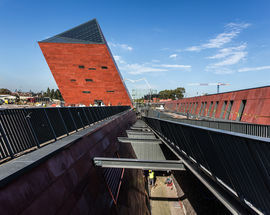 Wałowa donated to the museum by the city of Gdansk, the museum finds itself facing out onto the Motlawa river, hemmed in by the Radunia Canal and yards from the symbolic Polish Post Office building on Pl. Obrońców Poczty Polskiej. 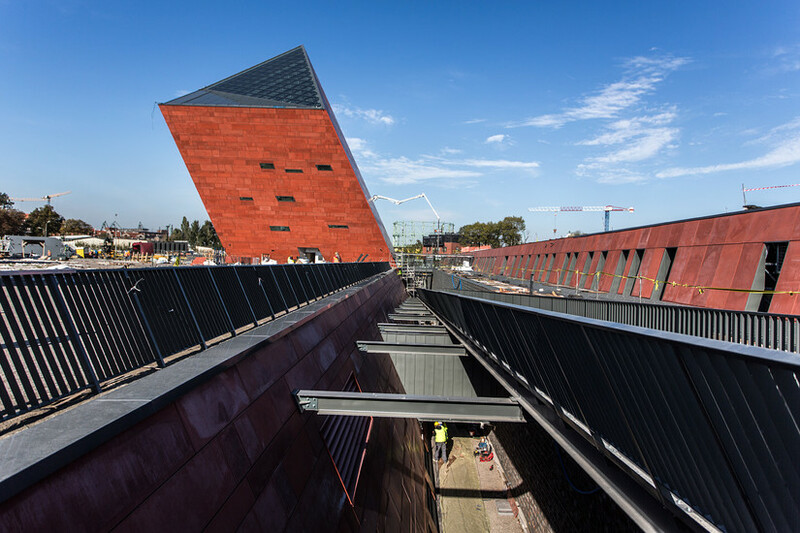 The museum grounds cover almost 2.5 acres, while the building covers 26,000 square meters. The building is very pointedly divided into three spheres, which reflect the connection between the past, present, and future: the past — the underground, the present — the square surrounding the building, the future — the leaning tower with the glass façade and ceiling reaching up to 40.5 meters. 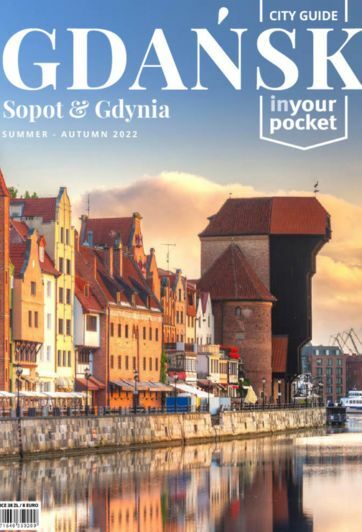 The tower houses, for instance, a library with a reading room, lecture and conference rooms, and will eventually be home to a café and a restaurant on the top floor with a panorama of Gdańsk. 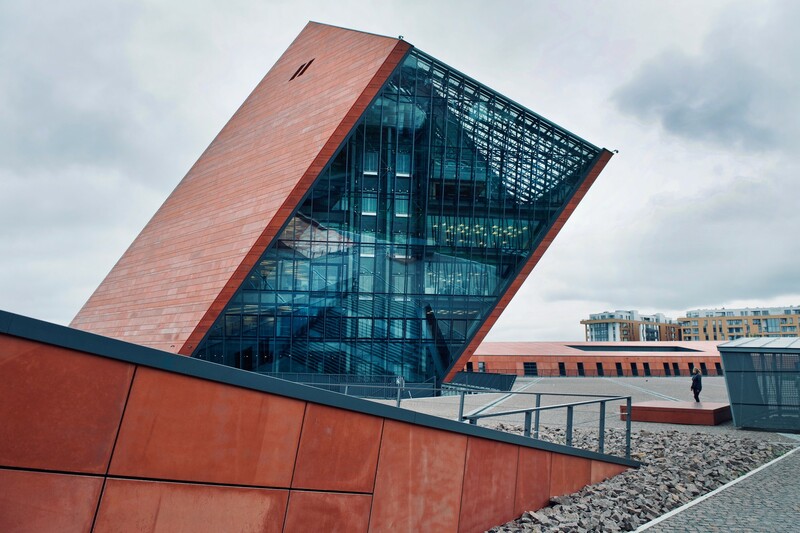 The architectural conception assumes that the entire evil of the war is hidden under the ground, and the ‘light’ of hope reaches within through a crack that runs along the square. It is the crack that forms the compositional axis of the entire concept of the placement of the main exhibition. 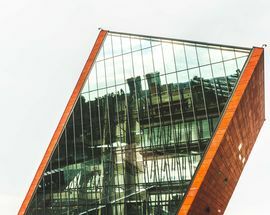 It links the interior of the building with the world outside. The entire arrangement of the area is complemented by the square that surrounds the building, where open-air events will be held and people will be able to relax. 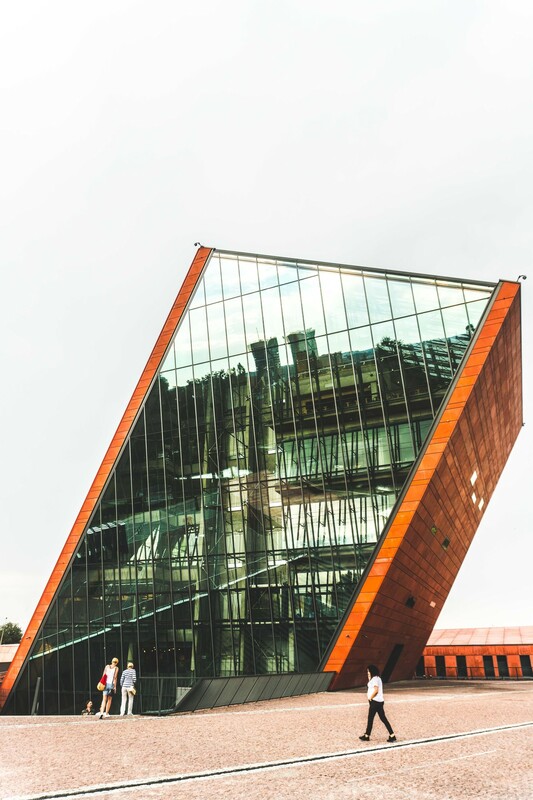 If you are in or close to the old town of Gdansk, we suggest you reach the museum on foot (it is about a 10-minute walk from the Crane). Be warned that the number of entrances daily are limited and that has caused some inconvenience already for people wishing to visit. Our advice is to go online and reserve tickets ahead of time and book your tickets in advance to avoid queuing and/or disappointment. 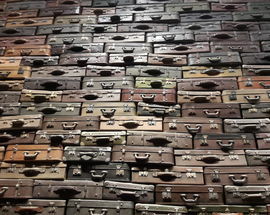 The first thing that we advise, particularly if you have more than a passing interest in the history of World War II, is to leave plenty of time to visit. We were advised that 3 hours would be sufficient but we’ve not been the only ones to observe that this isn’t nearly enough time to make your way around the exhibition. 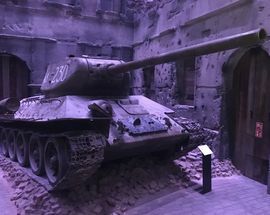 There is so much that you can see, watch and read that it is not inconceivable that a keen WWII buff could spend the entire day at the museum. With that in mind it is worth noting that at the time of going to press the restaurant and café were not yet open. 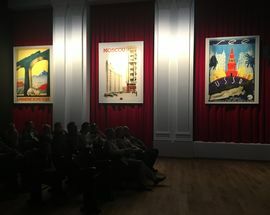 While the museum does not encourage people to bring food and drink into the exhibition, it is possible to leave and re-enter the exhibition during the day. Note you may have to wait to re-enter if the maximum number of visitors has been reached in the meantime. 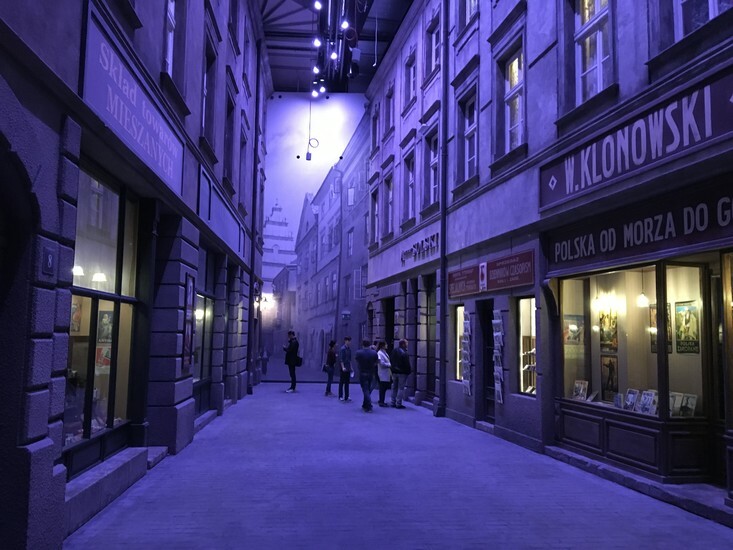 You might wish to consider leaving the exhibition for lunch and you’ll find a few very good spots within 5 minutes walking distance, first across the road at the Motlava restaurant or any one of Mercato, Fishmarkt Targ Rybny, Kubicki or Prologue at Targ Rybny close to the Hilton Hotel. We also advise that you pick up one of the multi-lingual audio guides before entering. They cost a mere 5zl and they are excellent. Not only are the commentaries very professionally done but the handset also recognises where you are in the building, delivers the correct commentary and then tells you where to walk to next. Another option is to hire your own guide and the museum has a recommended list. We suggest Malgorzata Andrzejewska. Finally, also note that as you are 14 metres below ground level in what is in effect a big concrete bunker, your phone signal is likely to so weak as to make calls impossible. We advise you to agree on a meeting place beforehand to avoid the problems we had in finding each other. The exhibition has to be seen to be understood and there’s not enough space here to explain in detail. Rather, we’ll try and highlight some of the many exhibits that caught our attention. 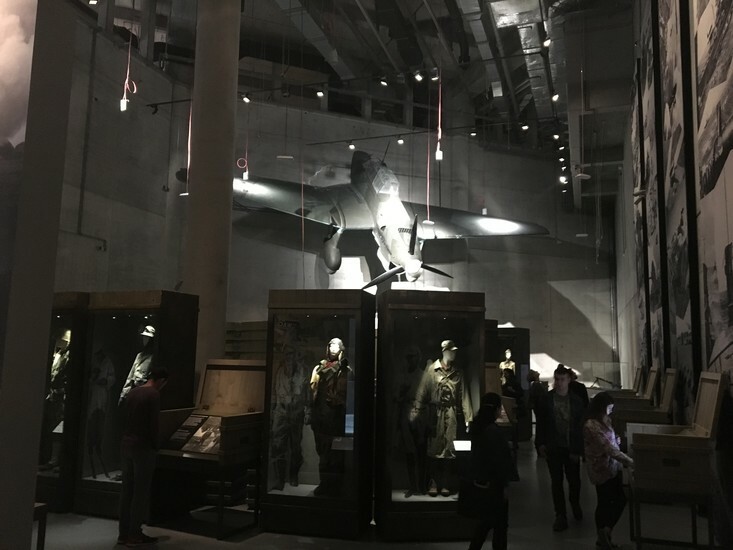 In total there are over 2,000 exhibits on display spread over three narrative blocks: ‘The Road to War’, ‘The Horrors of War’, and ‘The War’s Long Shadow’. 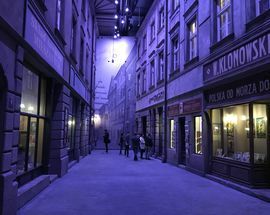 This is divided into 18 thematic sections, which is reflected in the layout of the exhibition rooms. 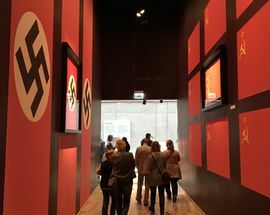 The first thing that you will come to, to your left as you enter, is an exhibition designed specifically as part of a Polish child’s education programme. You first see a pre-war Polish classroom where a film is playing before you walk into the living room of a pre-war Warsaw apartment. The apartment looks perfectly normal and there are examples of the types of food available to the family living there, typical pre-war furnishings and even typical children’s toys for the period. However as you pass into the next room you will see it is exactly the same room, but now there are German soldiers on the street outside. Warsaw is under occupation. 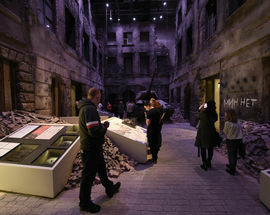 The next rooms continue that idea so that by the end of the war you can see what had happened to a typical Warsaw family home and the people who lived there. Unfortunately, this part did not have any English audio or signs, but quite frankly they’re not needed. 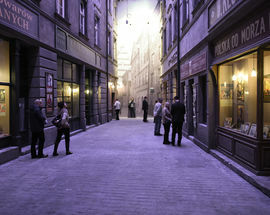 On leaving this part assuming you went in, you find yourself in the main part of the exhibition. The first thing to note is the spot you are standing, at the top of a long, straight, reasonably wide corridor. 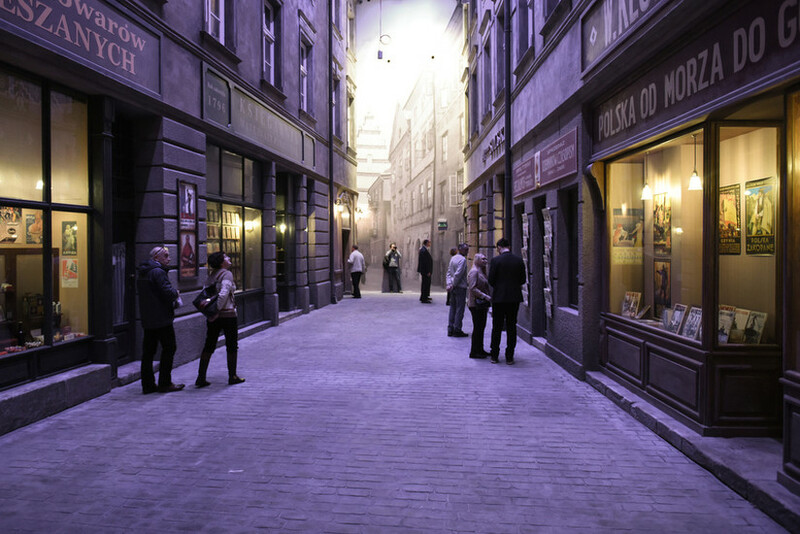 You are standing on what was once Grosse Gasse (Great Street) which stood here before the city was destroyed. The remains of the cobbled street were discovered when archaeological work was carried out on the site before construction began. 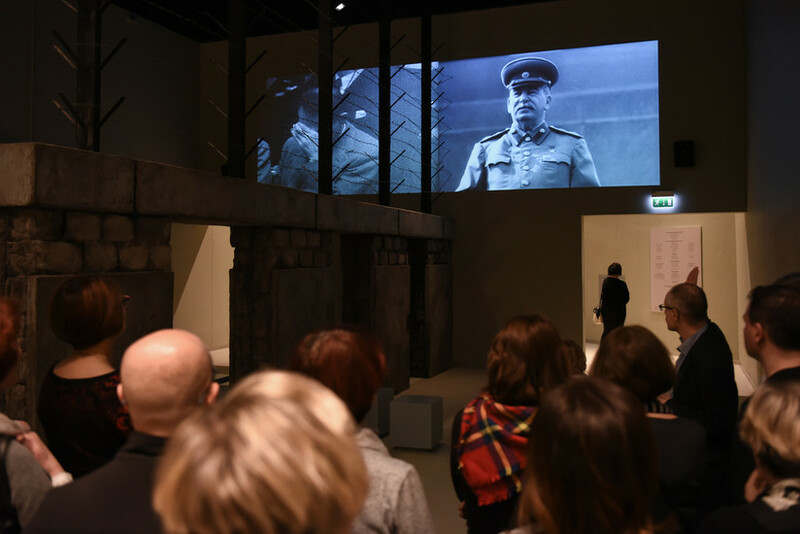 Onto the exhibition and you begin by learning about the background to war. 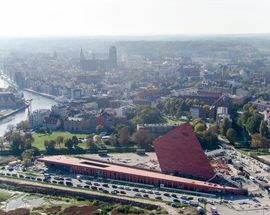 In the case of Gdansk/Danzig it is unquestionably linked to the conclusion of World War I and the Treaty of Versailles which resulted in the city being left in a political limbo, governed neither by the newly recreated state of Poland nor by Germany who had governed here in the 146 years previously following partition. This sets the tone for much of the rest of the exhibition. The story of the war, told against the backdrop of the story of Poland and even more specifically the story of Gdansk/Danzig. You’ll get to learn about pre-war Poland and its precarious position squeezed between an aggressive Germany to the west and a bitter and revengeful Soviet Union to the east. You’ll see that after years of appeasement to Hitler from the west, Poland became the first country to refuse to cede to the German dictator’s demands for the incorporation of the Free City of Danzig into the German Reich which created the spark that ignited WWII. As you leave this first part of the exhibition you can sense the flames which are engulfing Poland are about to spread way beyond the boundaries of Gdansk and Poland. 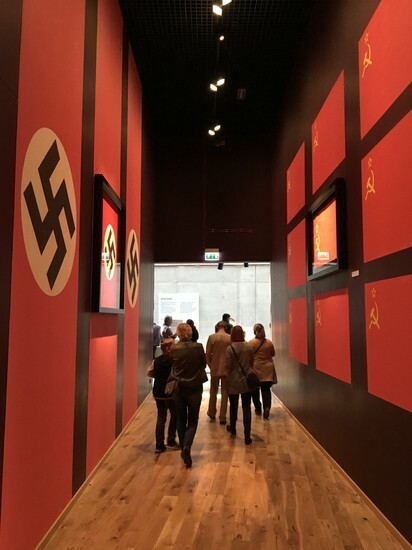 A copy of the document that sealed Poland’s fate – the Ribbentrop/Molotov Pact – hangs framed on the walls of a corridor of huge Swastikas and Hammer & Sickles. 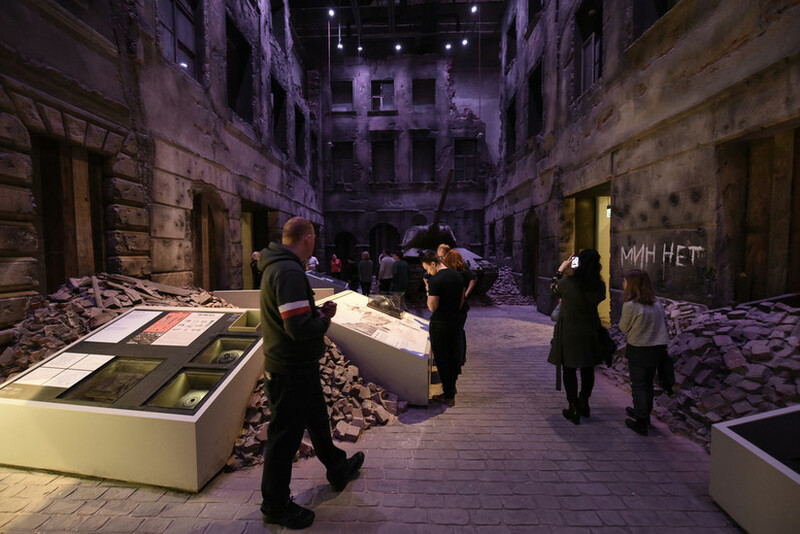 The exhibition goes onto to tell the story of the war from numerous angles and some of the exhibits are incredible. 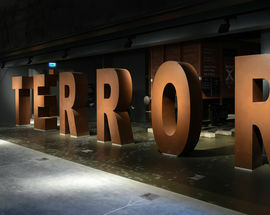 While the numerous films, photographs and excellent English translations mark this museum out as one of the best we’ve ever visited, it is the collection of artefacts, many the personal belongings of families involved with the war which were donated to the museum, that really bring the personal experiences of World War II to life. Keep an eye for example the wedding dress made by an American bride from parachute silk. Some of the paraphernalia that has been gathered, such as the Nazi Christmas tree decorations, has to be seen to be believed. 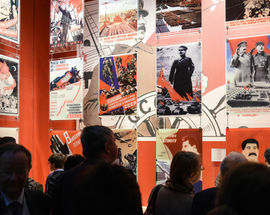 One of the most memorable parts is to be found at the beginning of the second part of the exhibition. In September 1939, an American journalist Julien Bryan was in Warsaw as the Germans attacked. He recorded what he saw on film for American news and his reporting, showing people trying to deal with the impending doom are quite remarkable. The photo of a young girl knelt over her senselessly murdered sister left an indelible mark. Take your time to visit each room as there is something fascinating in each one. 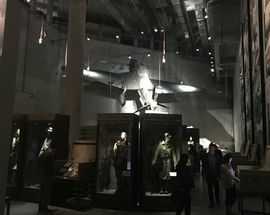 Room 8 contains lots of uniforms, weapons and equipment as well as interactive screens which give the amateur historian a clearer picture about how the war and specific battles developed and fronts ebbed and flowed. Room ?? deals with the story of the Enigma and the codebreakers’ battle to break it. 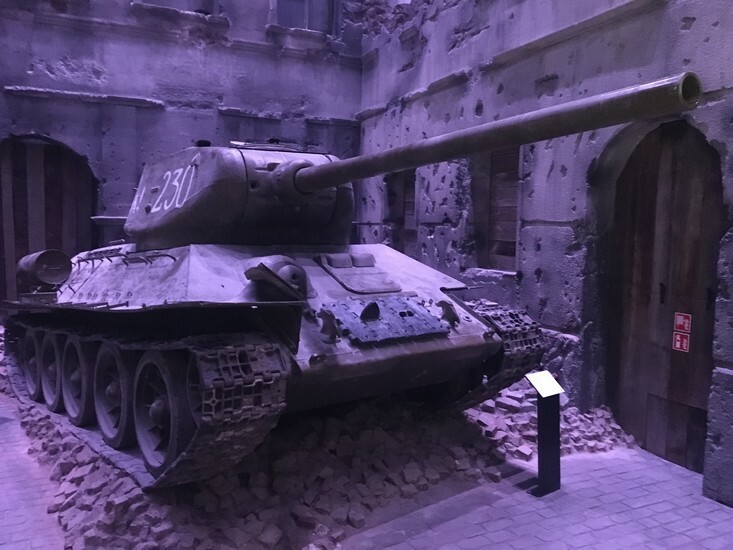 Later still you’ll find displays containing two tanks – the Sherman M4 Firefly which was part of the 1st Armoured Division (Polish) and the T-34 84. The size, weight and movability of both was such that both had to be placed in the museum before the museum was built around them. 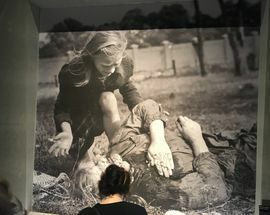 The final part of the exhibition looks at the aftermath. Europe was divided. Germany was divided. Eventually Berlin was divided. Poland, the defence of which had caused the UK and France to declare war, was destroyed and abandoned. 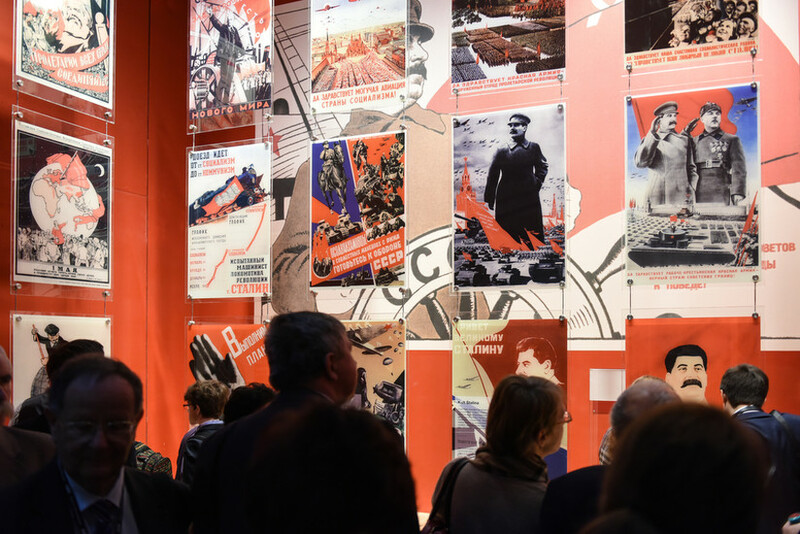 This part of the exhibition looks at how the world developed on either side of the Iron Curtain and how two blocs faced off for 45 years. It’s the references to the real people, not just statistics of those who died, and of human stories of survival and of heroism that really have an effect. You are shown that World War II is not just about the battles and the heroes. World War II is about also forced labour, torture, murder and the destruction of people and spirit. 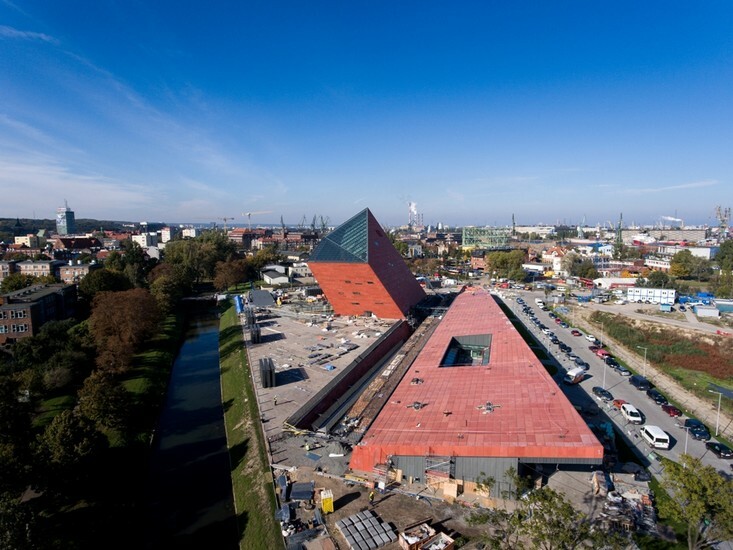 It is appropriate that this museum has been built in Poland as no people suffered as much as those that lived on the territory of Poland. 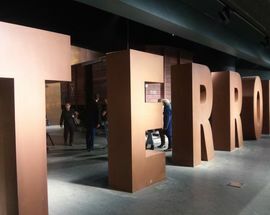 And if there is one message that comes out clearly from this exhibition, it is the one displayed in huge white letters at Westerplatte where the first shots were fired – Nigdy więcej wojny (No More War). Open 10:00 - 19:00. Sat, Sun 10:00 - 20:00, Closed Mon. 1 Jun 2019 - 30 Sep 2019 Open 10:00 - 20:00. Closed Mon, Tue 10:00 - 19:00. Admission 23/16zł, family ticket 55zł (2 adults and up to 3 children). Tue free. 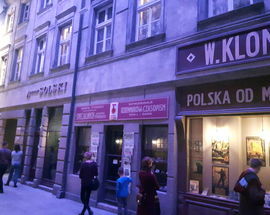 A cinema found in the Museum of the Second World War, which aside from showing films connected to the war and to exhibitions taking place there, also shows non-war related Polish and independent films. Reserving tickets ahead of time is imperative and should really be emphasised above all else. We failed to reserve and as a result we couldn''t visit the museum, despite arriving in person in the morning. A real shame because it looks pretty amazing. 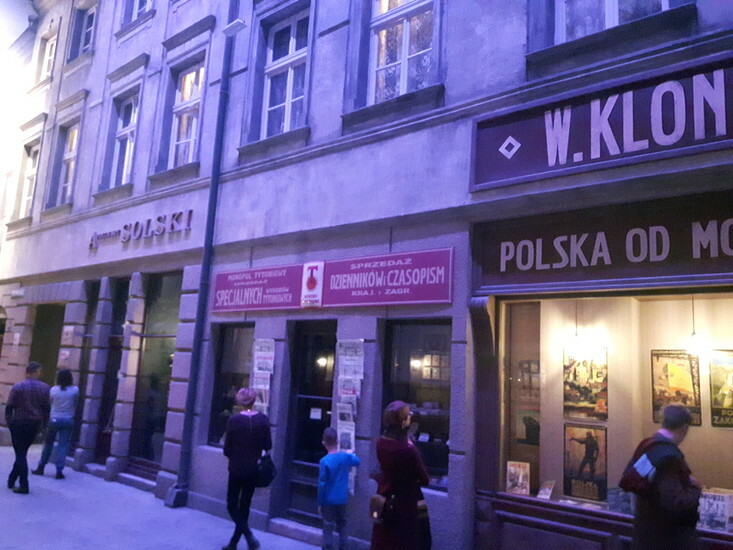 As there was no restaurant/cafe, shop or anything else open there, we simply had to leave (the nearby Polish Post Office Museum served as a bite-sized, though bit outdated consolation prize). I wanted to buy the book of the exhibit, which they had museum copies of for perusal, but surprisingly they had none for sale. This was in June, so I hope they''ve fixed that. 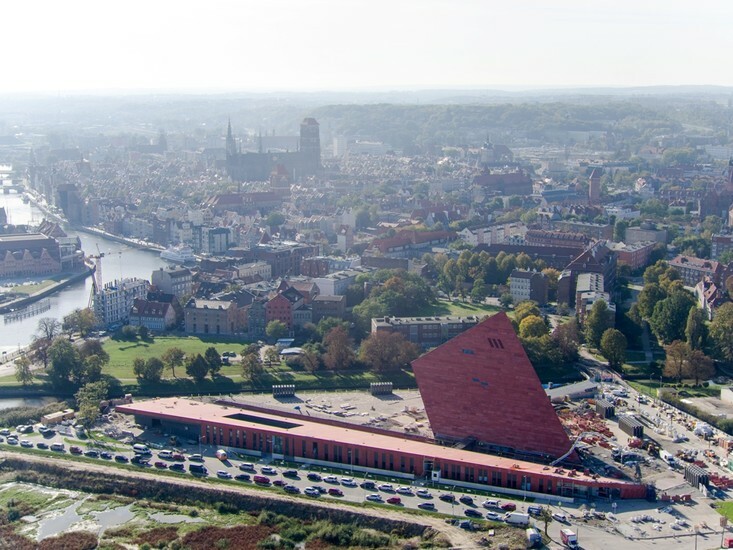 Will have to try and visit again next time I''m in Gdansk. We don&apos;t usually encourage you to comment on specific venues but we&apos;&apos;ll make an exception here. If you visit the museum please go onto our website and let us and the people running the museum know what you thought of it. If, like us, you are impressed then please let us and more importantly them know that. Like any new venture there are things that could be tweaked and improved upon but considering the size of this project and the immensely complicated story it is trying to tell, we think the team behind the exhibition and the architects and construction teams have done a quite phenomenal job. Help us to let them know that. 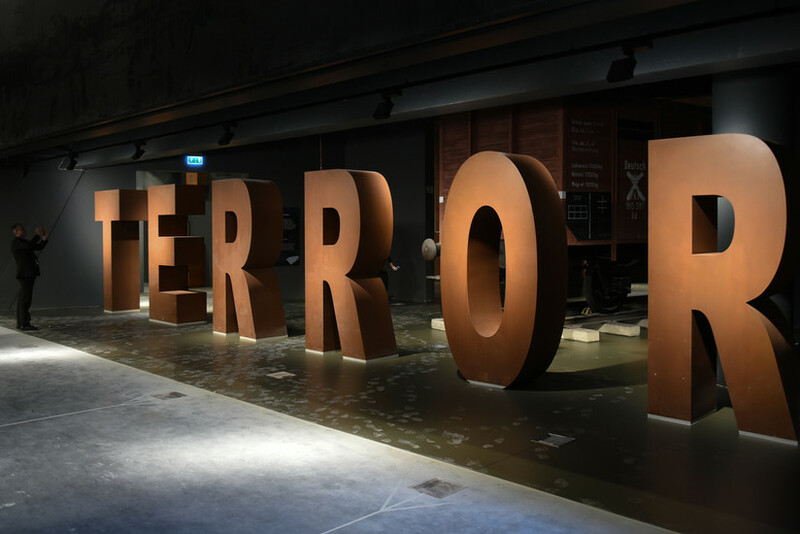 Excellent museum: an impossible task to cover the whole war, but this really seems to do it. 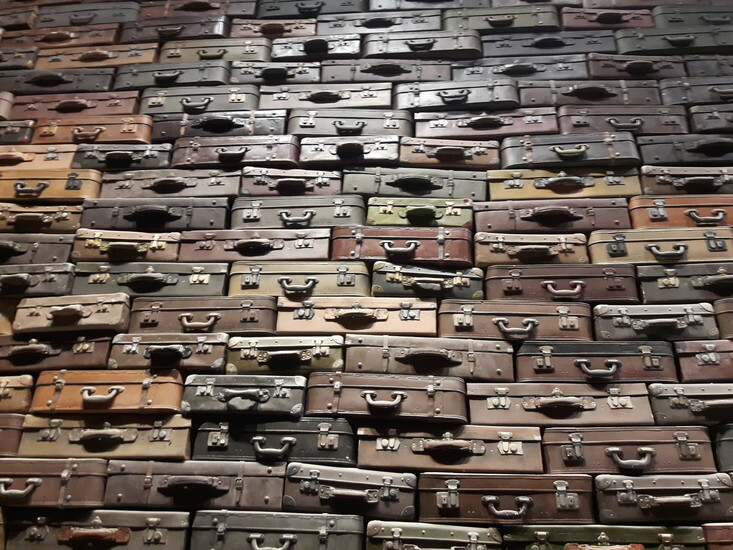 What I liked about it most was the mixture of traditional objects in glass boxes with lost of text and multi-media exhibits: touch screen as well as many interviews with people sharing their memories and experiences. 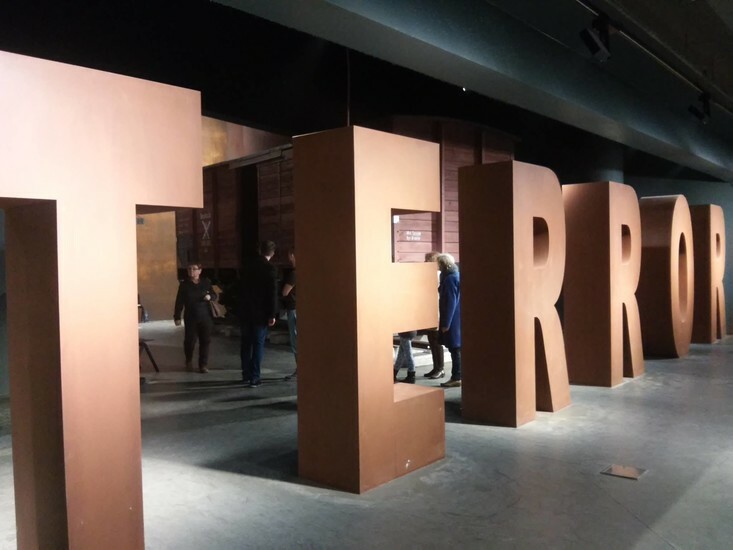 Unlike lots of other new museums, whilst there is music and background sound, it is never too loud, mawkish and overcooked. That said, there was one harrowing section about ethnic cleansing accompanied unintentionally by ''The House of the Rising Sun'' creeping in from the final post-war room, but this is a minor quibble. (I''m in my 50s now and can''t stand loud museums - Roads to Freedom and Warsaw Uprising Museum drove me potty and should come with ear defenders.) 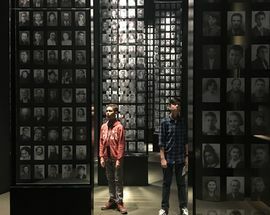 One criticism - we were told this would take 4 hours and planned accordingly, small nieces in tow, but 8 hours wouldn''t have been enough to see, read and, especially, listen to all the exhibits and testimonies. Plan to spend a whole day. However, at the moment there''s no food on sale, so sneak in a Mars Bar or two. 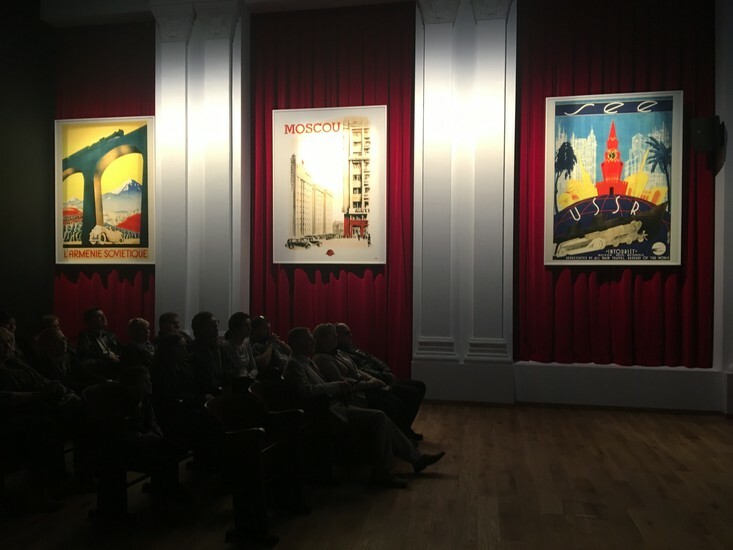 There has been some inexplicable political controversy surrounding the museum, but for me to complain that it isn''t Polish enough is: 1. 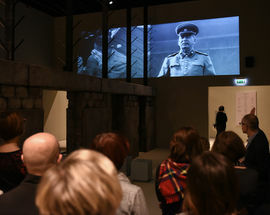 Simply not true - Poland is always at the heart of the museum''s narrative. 2. Missing the point - if I go to the National Gallery I don''t moan that all the best paintings are by Italians. 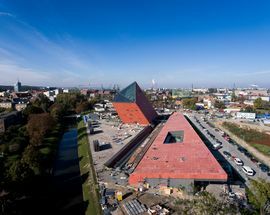 This is a museum for the world and the creators and curators have done Gdansk and Poland proud.